Porter’s Five Forces method is an analysis of an industries value. Michael Porter identified five fundamental forces that influence the area in which a business operates. Rivals – how many other companies can offer the same thing and to what level of quality. Many competing companies offering very similar services will have very little influence on the market. Threat of substitutes – how easy is it to substitute the product/service for an alternative, especially a cheaper option. This does not mean the same thing from a rival organisation but a viable replacement option. Buyer Power – how strong is the buyer’s position to drive the prices down. This can be affected by many things such as number of buyers and the importance of each individual buyer. If there is a buyers monopoly then they can generally dictate prices however if there are many buyers then they have no particular influence. 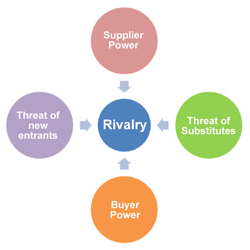 Supplier Power – how strong is the supplier’s position to drive prices up. This can be affected by many things such as the amount of choice of suppliers available, how unique are their services/products and the ease of changing supplier. Similarly to buyer power, if there is a seller’s monopoly then they will have a much greater influence then if there is a large choice. Threat of new entry – how easy is it to enter the area, what barriers are there to overcome. If there are little to no barriers then there is little security in the market as anyone could potentially join. If the barriers are strong then they will deter new entrants. Analyse each of the forces individually and brain storm any factors that are relevant to your market. By assigning each factor a value and then each force a collective value it will highlight which areas are weakest and need the most attention, helping you get into a stronger position.